About: Josh Sundquist only ever had one girlfriend. Why was Josh still single? To find out, he tracked down the girls he had tried to date and asked them straight up: What went wrong? Tiffany M’s (Murphy MS Student) Thoughts: I love this book, and I was hooked pretty quickly. It’s a bright and humorous autobiography Josh Sundquist wrote about his love life and how he has been single for 25 years. Well, he had one girlfriend in eighth grade for 23 hours…but that doesn’t count. I liked how he had a background, hypothesis, and investigation for each girl. The writing itself was enjoyable,and the graphs and illustrations that he made to go alongside the stories were pretty funny themselves. I would rate it a 4 out of 5 stars, and definitely recommend this to someone. Sophia X’s (Murphy MS Student) Thoughts: I’d recommend this book to everyone. It’s so funny and original, and just an overall amazing read. I would rate this book a 10/10. It is my favorite book out of all the ones I read. Nitya L’s (Murphy MS Student) Thoughts: This book is an autobiography on Josh Sundquist’s love life. When he was 25, he realized he had never had a girlfriend. To find out why, he tracked down every girl he had tried to date since middle school, and asked them straight up: What went wrong? I found this book to be hilarious. It was written in a creative way, with a background, hypothesis, and investigation for each “subject” (girl), like a science experiment. It was a little boring or weird at times, but I enjoyed the laugh I got out of this book. I would give it a 8/10. 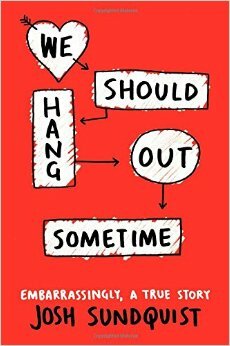 This entry was posted in autobiography, dating, Josh Sundquist, nonfiction, TX Lone Star List 2016 Nominee, We Should Hang Out Sometime and tagged autobiographical, dating, Murphy Middle School, non-fiction, true love, TX Lone Star List 2016 Nominee. Bookmark the permalink.